I don’t know about you but I love Thanksgiving. Actually, I love November-January because I love all the holidays. Over the past few years though, the holidays have been a little difficult. A family with multiple people working in hospitals usually means someone is absent for at least one holiday. Having worked in nutrition services for few different hospitals, I’ve always had to choose between working Thanksgiving and New Years, or Christmas Day. Most times I chose to have Christmas Day off. Luckily, this year I don’t have to work ANY holidays since I’m an unemployed intern/student. And although I’m living off of nickles and dimes because of this, I’m actually quite happy to have the holidays off this year. I feel like it’s that time in my life where I’m inbetween care-free, young adult life, and responsible, career-driven “real” adult life.. and I want to enjoy it while I can. Regardless of my age, I will always have the same contribution to any and all holidays: Baklava. For the longest time, my mom would set out all of the ingredients for me and I would go to town. Now I do it because everyone asks for it and I love making it. Something about painting the melted butter on sheet after sheet of phyllo dough is almost therapeutic. Yes I said butter. This is not a healthy recipe, and there is no way to recreate it in a healthy way without ruining it. Remember how my life motto is about balance and moderation? Yea, this is where that comes into play. My food philosophy explains it better. 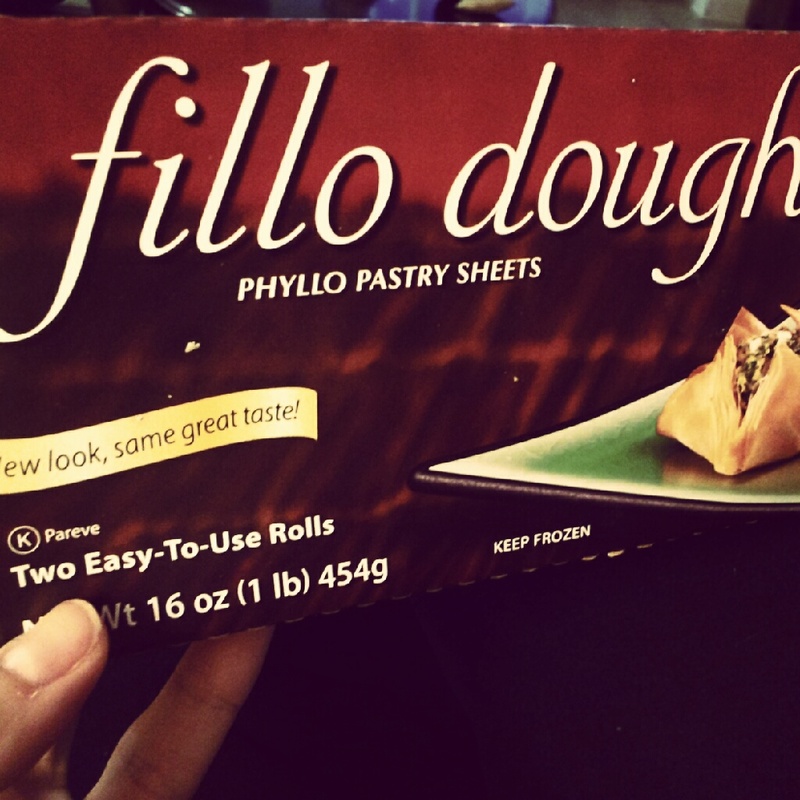 Let phyllo dough thaw in fridge overnight or on counter for 2 hours. Melt butter in a small saucepan on the stove, or in a microwave safe dish. Make sure you have counter space to work. I’m right handed so I unroll the phyllo dough on my left, place the baking dish in the center, and the pan of butter to my right. Keep nut mixture close-by. Brush the bottom of the baking dish with butter. Working quickly but gently layer 1 sheet of phyllo dough, then brush with butter. Don’t try to cover every square inch and don’t pour it on, but try to get good coverage. Remember, you’re working quickly.. and gently. Phyllo dough is very fragile. Continue the phyllo/butter layering until you’ve done 10 sheets, then spread 1 cup of the nut mixture evenly over dough. Careful with the first sheet of dough over the nuts as it may rip easily, but then do 10 layers of dough again. Athens dough comes in 2 packages per box, and you will need to use both but do not open the 2nd package until you’re done with the first! Repeat until all nut mixture is gone. This should give you 4 layers of nuts. Make sure butter stays melted during process, zapping in the microwave if necessary. 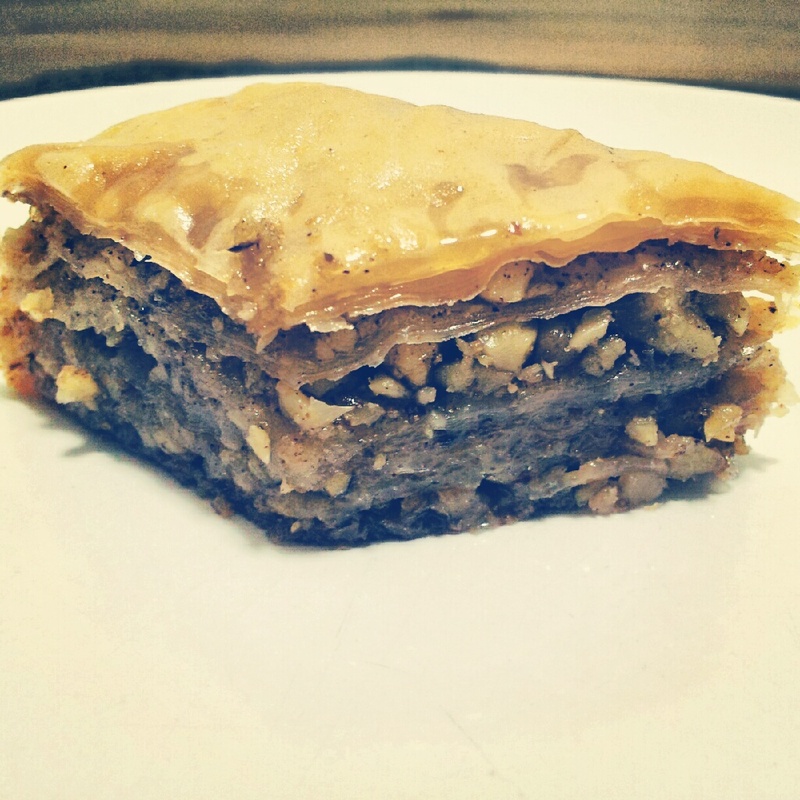 Once all the walnuts are used, then layer remaining phyllo dough until it is all used for the top layer. Make sure to butter the very last layer evenly, so that it browns well. Using a sharp knife, cut desired shape for serving. To do the traditional diamond, cut 5 lines across the length of the pan, then cut even diagonal lines about an inch apart, starting from the corner. Bake for 40 minutes, or until edges are browned and top is just golden. 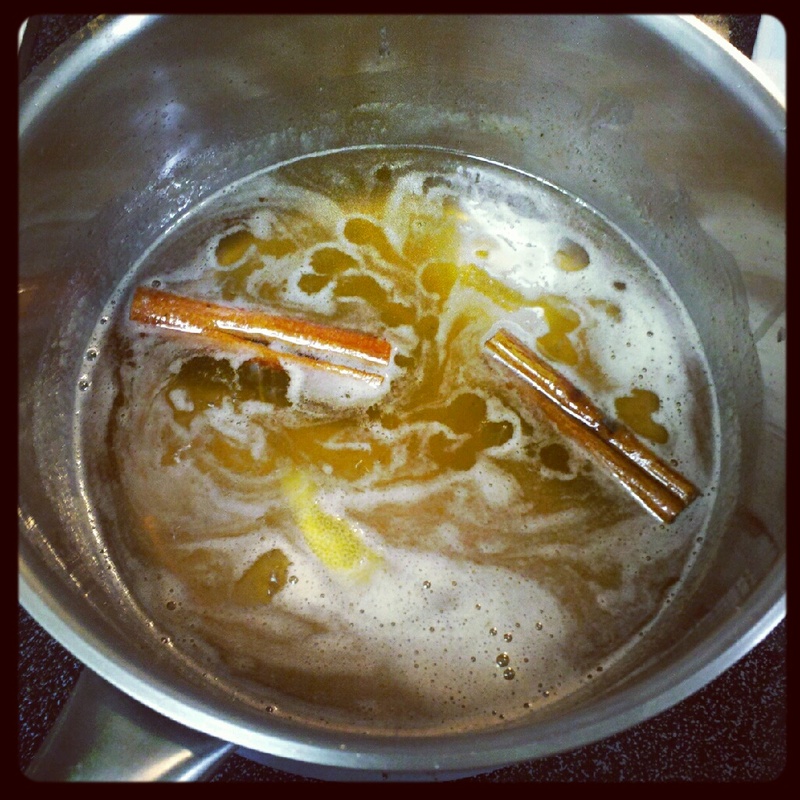 While the baklava bakes, get to work on the syrup. Combine ingredients in small/medium saucepan. Bring to simmer over medium heat, then reduce to low. Cook until thickened (10-15 minutes). Once baklava comes out of the oven, let cool for 5 minutes. Run knife through cuts from before baking to make sure pieces are seperated. Using a ladle, pour syrup over baklava, making sure to have good coverage. Let cool for at least 1-2 hours before serving. Best the next day. Okay, you guys, I know that seems laborous and time-consuming but I swear it’s not that bad. I threw my tips and tricks into the steps, and tried to be as specific as possible. It’s much more difficult said than done, so just do it! If you’re brave enough to try it but have questions, let me know! 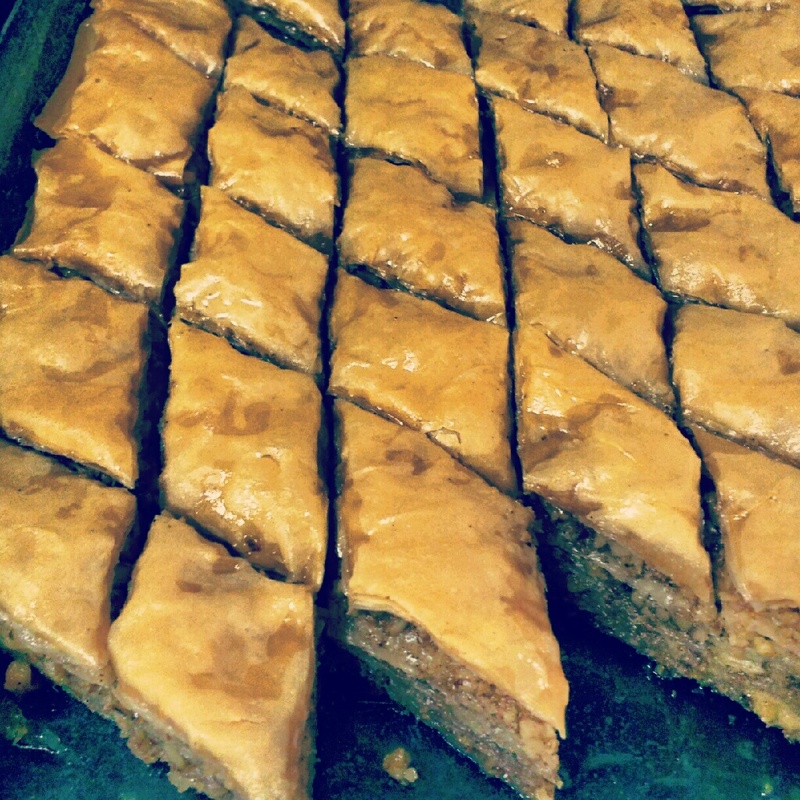 I’m your baklava-girl.